Our mission is to provide you and your party with the best experience possible for one of the biggest days of your life. If you have any questions about any of our policies, we would love to answer them. Feel free to call at 888-865-6960 or email us. You may reserve your date with a 50% deposit and signed agreement. Scheduling or attending a trial does not hold your date. We accept all major credit cards (Visa, MasterCard, American Express, Discover, ATM), checks, and cash. Payments for trial sessions are cash or credit card only. Trials take place Monday to Thursday at our San Francisco studio. If you prefer to schedule a trial without securing your date, we recommend scheduling as soon as possible to increase the likelihood that your wedding date will be available. Scheduling or attending a trial does not secure your date. See below for information about engagement session hair and makeup. If services are canceled four months or more before your wedding, the deposit is fully refunded (less $100 fee per booked artist). Please see below for information on modifying services after signing the contract. Our hair and makeup on-location service is amazing! We arrive with a lighted Italian makeup table that films and photographs well. For destination services, please inquire about our rates for travel and lodging. During the peak season (May 1 – October 31) there is a six-service minimum for Saturday weddings and a four-service minimum for Sunday weddings. 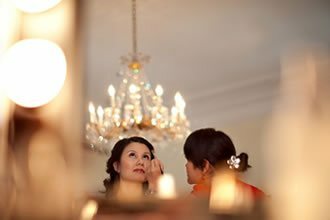 (An example of six services is one bride and two attendees for hair and makeup.) Promotions do not apply to peak season weekend dates. Touch-up services are available to maintain your look throughout the day and are billed in one-hour increments. 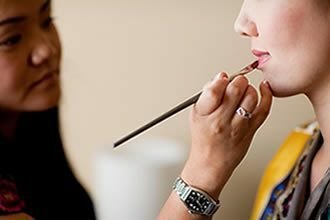 The hourly rate begins immediately after original services are completed and covers travel, parking, standby time, and touch-up services for the bride. Touch-ups include keeping your hair flawless in any weather condition (wind, rain, etc) and touching up your lips, lashes and eyes. For more than three hours, please contact us to request a custom quote for a day rate. If you are interested in changing your hair or makeup after your first session with Mei, please let us know so we can provide a competitive package for both looks. Depending on your desired stop time, there may be additional fees for starting services early in the morning. Most of our clients secure their date between 6-18 months in advance, but we also receive many inquiries for dates right around the corner. Saturdays, holiday weekend weddings, and unique dates (11-11-11, 8-8-18, etc) have the highest demand and are booked first. What are bridal trials? Are they required? Our bridal trial is a one-on-one session with Mei at our studio in downtown San Francisco. The trial run allows you to try your desired look before your wedding day. We strongly encourage them, however, they are not required. Trials take place at our studio from Monday to Thursday and are scheduled by appointment only. Your trial starts with a consultation with Mei where you go over looks and discuss your goals for your wedding. The makeup and hair styling usually takes two hours. Do you offer packages for San Francisco City Hall weddings and ceremonies? Yes. Hair and makeup for your weekday City Hall wedding is discounted. Does not apply to weekend City Hall ceremonies and cannot be combined with any other discount or offer. A copy of your City Hall licensing fee receipt (or other proof) is required to validate promo. Do you travel, or do on-location hair and makeup? Yes! A true, affordable luxury on your wedding day. Triple Twist On Location makes getting ready convenient and stress-free. This service is included for all local weddings, which means there are never any hidden fees on the day of your wedding. What is the on-location mobile studio? Do I need to do anything to prepare? Our on-location mobile studio is stunning — photographers, videographers, and our brides love it! We arrive with a beautiful Italian-made makeup table with lights and a mirror, commercial-grade director's chairs, and everything else required to service your party. This means you you do not need to coordinate lighting, tables, seating, or search around for the nearest wall outlet. We take care of everything! Setup and tear down is between 12-15 minutes, and we leave no footprint when we depart. Can I book a trial and use it for my engagement shoot with my photographer? We do not recommend booking a bridal trial for your engagement shoot. Bridal trials are designed to achieve the precise hair styling and makeup look to be executed on your wedding day, and generally, engagement styling differs from wedding day styling. Furthermore, we would be time constrained to create both a bridal look and an engagement look in one session. Finally, weddings and other bookings take precedence over bridal trials, which means bridal trials are subject to being rescheduled. 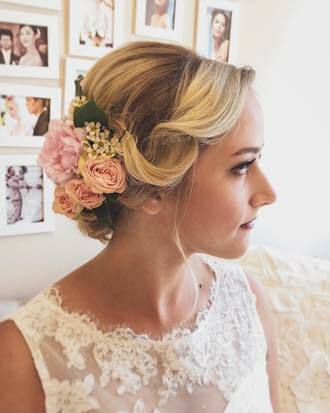 If you are planning on having professional hair and makeup for your engagement photo shoot, we offer event hair and makeup sessions which offer some benefits over bridal trials – these appointments are treated as booked events, cannot be rescheduled on our end, and can take place any day of the week (schedule permitting) after 2pm. Why is your company named Triple Twist? Mei is a former Cirque du Soleil star artist and her flying trapeze act ended with a 1080° twist (or, "triple twist") at 25 feet in the air. She was one of only few people in the world that could do this, and the only artist in China to perform this twist. Fun facts: Mei performed over 2,000 shows with Cirque in over 20 countries, she is featured on Cirque's Emmy-winning DVD, Dralion, and was awarded gold medals from international competitions in Paris, Monte Carlo, and China. I was shopping and I saw some makeup stations that seemed dirty, is your equipment clean? Yes. We clean everything. 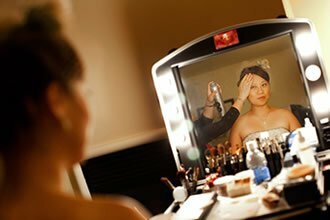 We clean our on-location makeup table for each wedding and use new padded liners for each client. Our studio stations are cleaned after every trial, and our studio is cleaned nightly by a cleaning crew. Powder puffs are yours after the trial (never reused), eyelash brushes are discarded after every client, lipstick and foundations are applied to a clean Ben Nye palette (no client-to-client transfer), and our makeup brushes are cleaned with a safe, professional cleaner after every use and allowed to dry for 24 hours. Want to read about the specifics? Check out our blog post: How We Reinvent Cleanliness in the Makeup and Hair Industry. How can I determine the timing for the day? We will prepare a detailed schedule based on your party size and services requested. Pass it around to your party, and you have one less thing to worry about on your big day. I cannot make it to a trial, can I still book Triple Twist for my wedding? 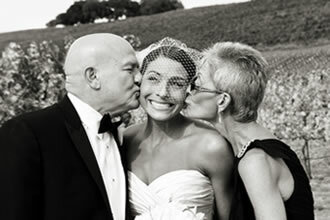 Yes, we have had the pleasure of working with many international and out-of-state brides. Mei will conduct a virtual trial. Please contact us for more information. I have sensitive skin, what products do you use? We use Makeup Designory (MUD) foundations and makeup in combination with other Bobbi Brown, Chanel, Dior, M-A-C, and Shu Uemura products. Our professional MUD products are lightweight, last all day, and are hand-mixed on a palette by Mei to perfectly match any skin tone. While no one can guarantee that an allergic reaction will never occur (as there are simply too many factors to consider), we have never had a breakout or allergic reaction from the use of our products, even with clients who have stated that they have sensitive skin. Can I reduce the size of my party after I secure my date? We encourage you to take your time to finalize your party size and services prior to booking, as within four months of your wedding we unable to reduce services in your party. Can I add people to my party after I secure my date? If we have not committed to another event after yours, we certainly can add services and send you an updated schedule. Read the top reasons why our clients love and choose our services.